Shoebox layouts continue to proliferate on both sides of the Atlantic. In the U.K. there’s even a shoebox competition running at the national narrow-gauge exhibition, ExpoNG, scheduled for late October. If you want to enter, the deadline is September 1, 2004. Here’s a rundown on some of the under-construction shoeboxes that we’ve encountered in recent months. From Martin Hogg, in Mansfield, England, come these delightful shots of the Schubert Box Company, currently under construction in OO9 (HOn30) scale. Martin is using the canonical shoebox track plan, but substituting a traverser for the sector plate, and a standard gauge siding for the dock and waterfront section. Very nice! For more photos and information, check Martin’s website. THIS SHOEBOX USES PECO SECTIONAL TRACK! Also from England, Keith Addenbrooke noted that the shoebox he owned would nicely accommodate three lines of Peco OO/HO Settrack. So he adapted the track design and added the box lid containing a traverser on the right-hand side. The result: Shoe Horn Wharf, now under construction. 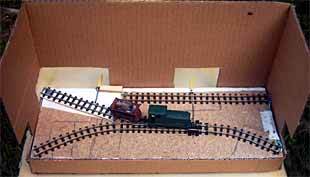 Note the traverser converts this tiny layout into a functional Inglenook switching game! 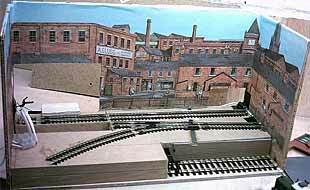 Andrew Smith, yet another Englishman, is constructing his OO9 (HOn30) shoebox layout as a scene from his larger slate-handling line. Here’s an under-construction photo. 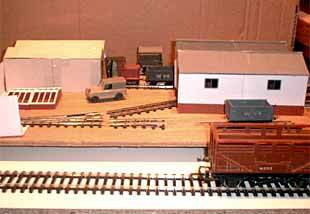 Chris O’Donoghue, a member of the Greenwich &amp; District Narrow Gauge Railway Society, is familiar to shoebox layout fanciers from his well-known Sabot’s Wharf layout. Here’s a sneak preview of his latest effort, Wills Walled Nursery. Says Chris, “Spurred on by the hint of a shoebox competition, the discovery of a 21×12 inch bootbox and inspiration from a local nursery, Wills Walled Nursery is starting to take shape. The layout size has been kept to 13×12 inches to stay within the spirit of the competition, leaving room for two fiddle yard roads and storage for stock. “One loco, at present a Ruston or Lister diesel, is used to shunt four varied wagons. Inside the glasshouse is a sliding traverser and the potting shed houses a sector plate. Each will hold only the loco and one wagon, so in order to select a particular wagon from the storage road both sector plate and traverser have to be used to move wagons to the transfer siding. Not coincidentally, the Greenwich &amp; District Society folks are hosts to ExpoNG, scheduled for 23 October in Swanley, Kent. This year’s exhibition features a competition for shoebox layouts, many of which have been inspired by this website. 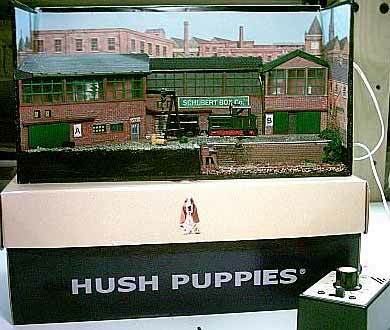 See “Shoebox Madness” elsewhere on this site for more about these tiny layouts. Alexander Kaczmarek, who lives in Berlin, Germany, designed this tiny corner layout after a very short prototype line owned and operated by the Federal Distillery in Berlin. According to Alexander, “With one loco and a street/track-truck this tiny railroad served the distillery and two other industries for 40 years. It was a busy branch line with only a few turnouts and a really short network (about 1,7 km!). “I tried to transfer this real micro into a Märklin-layout. As you can see the connection between mainline and distillery-railroad is only given by a turntable (as it was in reality). The railroad was squeezed between the mainline (mostly suburban trains), the small channel called “Nordgraben” and the infamous Berlin Wall, which seperated West from East Berlin. “Here’s how operation worked: The train from the mainline-yard enters the stage on one of the two tracks on the left hand. Then you have to move each wagon to the turntable (one after the other!). On the other side of the turntable another switcher is waiting. It receives the new wagons and hauls them to the distillery and the other industries. As you can see the operations are pretty complicated, and you will have enough work for two operators: one on the mainline-side and one on the distilleries side!” What a spirited site for a layout! Jeff Hartmann, who lives in Long Beach, California, designed this little corner layout to fit an 8″ wide bookshelf unit. It represents a small, urban industrial district and includes three spurs to industries along with an interchange siding and an engine house. The layout is basically an Inglenook switching game with extra sidings to add additional operations. The interchange track insures a variety of cars entering and leaving the layout. Trackage includes two Peco small-radius switches and two Peco small-radius curved switches. For more glimpses of Jeff’s modeling activities, visit his website. City Freight is an urban switching layout designed to fit on a self-supporting IKEA shelf unit called LACK, measuring 110×26 cm. It was designed and is being built by Ted Hawkins, who lives in Beckenham, Kent. The catch is that this cramped location has no room for a runaround track, so a second locomotive — a “critter” — is needed to complete many switching maneuvers. 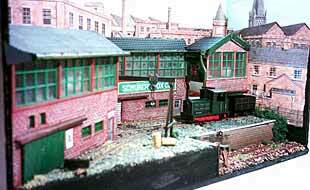 The “site” locomotive is housed in the loco shed at the left. Cars enter at the left rear, either placed by hand on the track or propelled from an offstage fiddle yard. Although Ted is not planning to use a traverser, I added an optional one inside the left-hand building, to provide extra flexiblity in shunting — and the possibilities of having “empties in – loads out” operations. City Freight was designed as an On30/O16.5 layout.